Heat oven to 400°F and position a rack in top third of the oven. Wash potatoes with a stiff brush and cold running water. Dry. Coat the potatoes with one tablespoon of olive oil and sprinkle with salt. Bake potatoes for approximately 50 minutes, or until potato completely cooked through (timing depends on size of the potato). 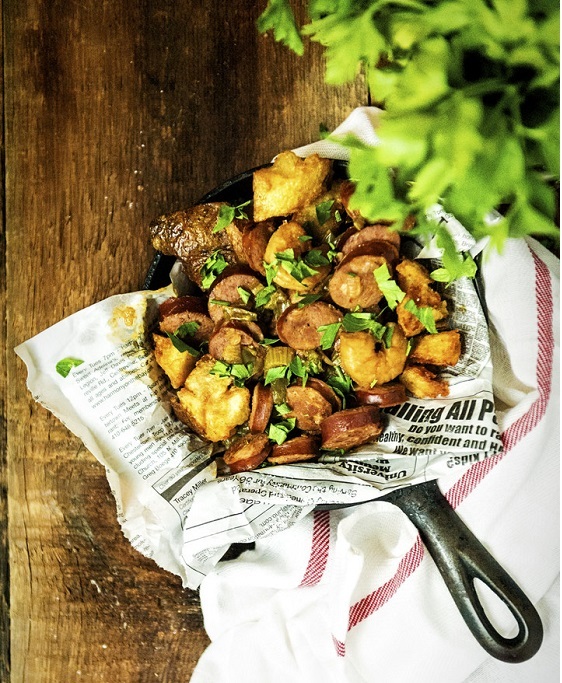 Cool potatoes overnight (great use for a leftover baked potato). When you are ready to prepare the potatoes, heat canola oil in a sauce pot to 375°F. Leaving the skin on, rip the potatoes into medium to small bits. Deep fry potato shreds in canola oil for 2 minutes. Remove from oil and refrigerate until serving. When ready to serve, re-fry the potatoes in the canola oil for 1 minute, until crisp. Remove from fryer and place in a large bowl. Toss the potatoes with remaining 3 tablespoons olive oil and butter. Season with salt and pepper. Add the parsley, reserving one tablespoon for garnish, and the blackening seasoning, tossing lightly. Heat a heavy bottomed pot over medium high heat. Add the bacon fat. Add sausages and cook until browned. Remove and reserve. Add the vegetables and cook until translucent. Add the flour and cook until medium dark brown. Add the paprika, cayenne, thyme and return the cooked sausage to the pan. Add the chicken stock and stir well. Bring to a simmer, add the crawfish tails and simmer 45 minutes over medium low heat. Mix the file powder and water together. Add to the soup, and stir well. Season with salt to taste. Place ripped potatoes in the bottom of a shallow bowl. Garnish with reserved parsley and serve. Courtesy of: Idaho® Potato Commission and David Woolley from the CD Culinary Approach. Used with permission.